Scentsy introduced some delicious new wickless candle fragrances for our Spring Summer 2019 season. Bee My Honey: PINEAPPLE RINGS topped with SWEET HONEY and JASMINE BLOSSOM make a treat fit for a queen. Churro, Churro! : BAKED PASTRY sprinkled with CINNAMON SUGAR captures that heavenly churro charm. Dewy or Don’t We: We definitely dew! JUST-CRUSHED BASIL over RIPE CANTALOUPE is a gift from the garden gods. Farmers Market: Crunchy CARROT and CUCUMBER with a HINT OF ROSE will have you seeing (and smelling!) green. Mickey Mouse & Friends: Celebrate everlasting friendship with a fragrance almost as sweet thanks to GEORGIA PEACH accented by pops of ORANGE PEEL and VANILLA. Mojito Mambo: Sparkling CLUB SODA, crushed LIME and muddled MINT LEAF sway away with WHITE RUM. Now & Zen: SUNNY GRAPEFRUIT balances CALMING CHAMOMILE in a yin and yang kind of love story. Pina Colada Cha-Cha: Island COCONUT and zesty PINEAPPLE lead; WHITE RUM and VANILLA BEAN follow. Pink Cotton: Find your fantasy on a cloud of CLEAN COTTON swirled with fruity PINK BERRIES and VANILLA SUGAR. Prickly Pear & Agave: PRICKLY PEAR and AGAVE are sweet as a desert sunset behind a dreamy veil of SHEER PETALS. Strawberry Taffy: Nostalgic notes of VANILLA TAFFY folded with STRAWBERRY PUREE beckon straight from memory lane. Waves & Wonders: Dewy BEACH GRASS and COASTAL CYPRESS will have you feeling the AMBER SAND between your toes. For the best savings, shop through my special BUNDLE AND SAVE link, to get 6 candle bars for the price of five. Who doesn’t love free? Mix and match scents. How Long Does Scentsy Last? You may have heard 60-80 hours, or 8-10 hours per cube, or a couple days, or a week, or 30 days or any other quantifiable number. But guess what? That information is WRONG. That inaccurate information has been floating around for years. It’s been an uphill battle to get the correct information out there. Sure I could tell you that the scent paks, scent circles, and travel tins last UP TO a certain number of days. I could also tell you that you can make UP TO a million dollars a year with Scentsy. Both are possible, yet not very probable. It depends on if you leave it on 24/7 or a few hours each day. It depends what size warmer and what size room. 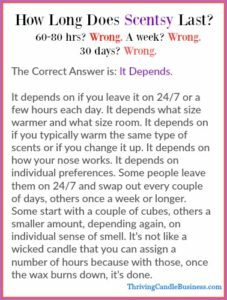 It depends on if you typically warm the same type of scents or if you change it up. It depends on how your nose works. It depends on individual preferences. Some people leave them on 24/7 and swap out every couple of days, others once a week or longer. Some start with a couple of cubes, others a smaller amount, depending again, on individual sense of smell. It’s not like a wicked candle that you can assign a number of hours because with those, once the wax burns down, it’s done. What if I told you “It lasts 30 days.“, but because of any of the factors mentioned above, after a week you stopped really smelling it the way you did when you first experienced it? You’re going to be disappointed or maybe even feel like you were duped, right? But what if I told you “Some people say a week, others longer.” Then for you, 6 weeks later every time you walked into that room you still smelled it. Great experience and feelings about Scentsy, right? Now do you see why it’s impossible, unrealistic and unreasonable to give a quantifiable time frame for how long Scentsy lasts? Cranberries are a Thanksgiving dinner tradition. I have yet to meet anyone who actually likes them though. But you will love these cranberries. Cranberry and Tinsel Scentsy BRICK. This is a Limited Time Only offering and it’s huge. A brick is equal to more than five standard candle bars. Described as Mulled cranberries, Siberian fir needle and cedarwood sparkle and shine. Cranberry Garland Scentsy Bar. Described as Sweet-tart cranberry, grounded by sage and earthy pine cones. Very Merry Cranberry Scentsy Bar. Described as Lush, red winter berries pop against a backdrop of snow-covered cedar, creating a lovely winter landscape. Winterberry Apple Tea Scentsy Bar. Described as Winter tea cozies up to Cranberry, Apple, and Honey. For the best savings on Scentsy wickless candle bars, use my special Bundle and Save link to buy five, get one Free! Why was the turkey ashamed? It saw the cranberry dressing. Snow falls outside. You’re curled up with a chunky blanket in a toasty cabin. Welcome to the holidays, and to our new Hygge Wax Collection. Inspired by the Danish idea of comfort, this seasonal assortment includes five Scentsy Bar fragrances designed to bring even more joy and warmth to the most wonderful time of the year. Hygge, pronounced hoo-guh, represents a trend our fragrance team has followed closely, resulting in a collection your customers are sure to welcome with a hoo-ray! Calming Woods:?Wander through a serene stretch of vanilla bean, creamy sandalwood and rich cedarwood. Cozy Kitchen:?Warm up to a blissful batch of warm oats with brown sugar and a spicy cinnamon swirl.? Quiet Clementine: Sweet orange, vanilla orchid and sandalwood bring tranquility to a busy mind.? Toasty Cabin: Bergamot zest, black pepper, wild fern and acacia wood create the perfect space to hide away.?? These five Scentsy Bars can be purchased in a variety of ways. As a collection, $24: All five bars come in a purple stocking (while supplies last) ideal for gift-giving. As a multipack bundle, $24: Customize your own five-bar assortment. Stocking not included. Individually, $6 each: Stocking not included. But don’t delay. These are LTO – Limited Time Only, and sold out when gone. Get over to IncomeWax.com today for UPS delivery to your door.